Please note, the Princess Victoria has re-opened under new management. Time Out Food & Drink Editors, September 2017. 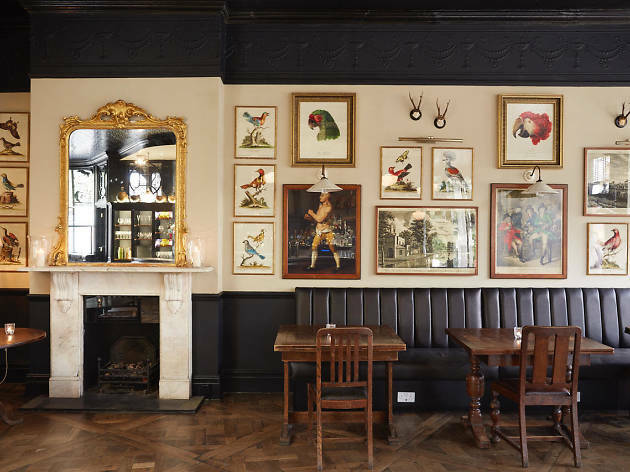 Located on the hectic Uxbridge Road, this regal boozer is the best pub for miles around, combining a beautifully restored interior that’ll induce pub envy, highly respectable food, a well-selected drinks menu and friendly, long-serving members of staff. Frosted front windows convey a snug feel whatever time of day or night, and a central island bar vies for your attention with photos of classic movie stars peering down from the walls. An adjacent dining room serves up restaurant-standard steaks, seafood and Sunday roasts, although all-day moreish bar snacks (scotch eggs, sausage rolls and so on) may well kill any ambition you have for dinner. Ales are well-kept with Timothy Taylor Landlord or UBU Purity almost always available, while wine is taken seriously here – the list stretches to some 30 pages detailing regions and varieties in painstaking detail. Visit during the day at weekends and you’ll almost certainly walk in on a gaggle of parents with their kids in tow. And if footie fans aren’t your thing, keep an eye out for QPR’s home fixture list. Regardless, the Princess Victoria is a cracking pub, certainly up there with the capital’s finest. A former gin palace in Shepherd's Bush, we pride ourselves on being a local, food-led pub with a grand bar, spacious dining room and large private dining space perfect for group parties and events. Expect a traditional British menu with a contemporary twist, plus an award-winning wine list. This pub has recently reopened under new management and it looks great. I went for a Sunday roast and I have to say it's one of the best roast dinners I've had in London - the beef was so delicious. I can't wait to go back again. Note - definitely book a table as it was absolutely packed at 5pm on a Sunday. This place has been recently reopened under a new management after a refurbishment. 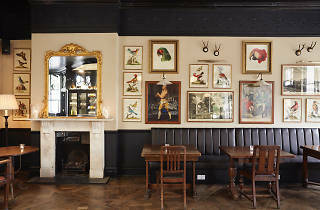 The interiors make it such an elegant pub and the ambient is very relaxed and warm. I'm personally not a fan of pub food, but I got to admit the food menu here was on another level. I went with a friend and we each had 3 courses. Everything except for one of the starters (aubergine puree and courgette salad) which was a little bit flavourless, were absolutely amazing. The ham croquettes are to die for! Not to mention the sticky toffee pudding. The waiter who was serving us was super attentive and helped us choosing the right wine to go with our food. The new management (Three Cheers Pub Co) have some other pubs in west and south London and I would really love to try them as well! To note this has recently reopened under new management from the Three Cheers Pub Co - we visited for the opening weekend to try the Sunday Roast. The food was good although the staff were a little overwhelmed but this may be teething issues - my veggie sunday roast was served accidentally without any gravy (I had to ask for some) and one of our drinks was served with a funny taste (and to their credit they fixed this after we alerted them to it). Overall, the quality of food was very good. We'll likely return once they've ironed out the minor opening issues. Nice open space, good vibe in the bar and a well priced wine list. I don't know the area very well but I'm open to admitting it's probably the best in the area. That said, I found the food horribly overpriced for what it was and the portions were small. I mean it was nice food and the service was good but just not that impressed when we got the bill. I came home hungry after spending £45 for dinner. We are very lucky to have this awesome pub and dining room as our local. Incredible Gin infusions, top quality Sunday roasts and lots of special events like a Sipsmith Gin Tour. Love this pub! Really friendly bar staff and great wine list. Also, the infused gins and vodkas are great! Been going here regularly for over a year. This pub has stiff competition from some serious foody pubs in the area, The Angelsea Arms and The Havelock Tavern to name a couple. But this pub holds its own if not surpasses the others. It is not pretentious and has a mixed clientele compared to the others but still manages to be very classy. You won't eat this good for this price in man other places. And the drinks are up to standard too. Don't listen to the bad reviews for others. They are clearly philistines. Excellent service. Went here for my birthday and ordered the special, which I ended up being not what I expected. They were more than happy to replace it with another option (free of charge) and were apologetic that it was not up to usual standards. The replacement of hanger steak was delicious. All other diners enjoyed their meals very much. Would highly recommend. Generous sized portions of impeccably cooked gutsy food. Wonderful bursts of flavour, and every item on the plate contributed to that (no irrelevant garnishes which always irritate me). Triple cooked chips to die for, excellent service, great choice of beers. Have eaten here many times and it is always first rate. Big fan of this place. We have been here several times for meals and the food never disappoints. It is quite a different menu from standard gastropub food but I think that makes it all the better. Good range of wines and ales as well. I have never eaten this well in the Eagle (mentioned below) which whilst not bad (and excellent for BBQs in the summer), has a pretty uninspiring menu and is at least a league below the Princess Victoria. This used to be a place that nether disappointed me, but not anymore. What used to be a great bar with a fantastic mood is now a place where it is easy to find loud and drunken customers who are making fun of other guests - especially on Fridays. I cannot recommend a trip across town to this place to have drink in a relaxed mood. The likelihood of the pub overly filled or even worse closed for a private function is just too high on the weekends. N.B. if the pub is closed is not announced on their website neither. We had a very dissapointing meal here. The food was hit and miss with some really good dishes and some dissapointing. But the service is the thing that really lets this place down. We sat down at 7pm and they tried to move us on before 8:30pm even though there was about 6 spare empty tables around us, I complained and got an unconvincing apology from the manager. Then despite apparently needing the table, we had to wait an age for deserts and then we had to constantly try to get attention to receive the bill, pay and leave the premises. I would not return again for food but I would for a drink in the pub which is lovely with friendly bar staff. We had heard so much about this place, and were disappointed tonight. Perhaps, we had high expectations. The food contains so much Pork dishes, and it's a difficult menu for vegetarians. There were no salads on the menu! The food was OK, nothing extraordinary. Staff is not very engaging.If you like a cosy place with great food, I would go to another place in the area- The Anglesea Arms.